The Forgiveness Effect – A Journey through Forgiveness to Healing! A Personal Transformation Story…showing how a powerful ripple effect can occur through your life! In The Forgiveness Effect, Lou provides a helpful guide on living a healthy life and how forgiveness is an essential part in gaining peace, joy and success for yourself and those you impact. Through his story, Lou shows that no matter what you have been through, you can still gain control of your own life and turn any situation around to grow through your adversity! Lou makes it known that your daily habits can make or break you and that you can change anything in your life when you put the effort into it. He shares a vital point that if you want to have a healthy impactful life or even good relationships and personal well-being, you must make time for yourself. In today’s fast paced and even faster changing world this is a “MUST DO” in order to live on purpose and with passion rather that mediocrity and no direction. All of us have been hurt at one time or another. However, forgiveness allows you to let go of the negative energy around that hurt. Forgiveness does not condone the action but does however free you from the toxic effects of the negative emotions. 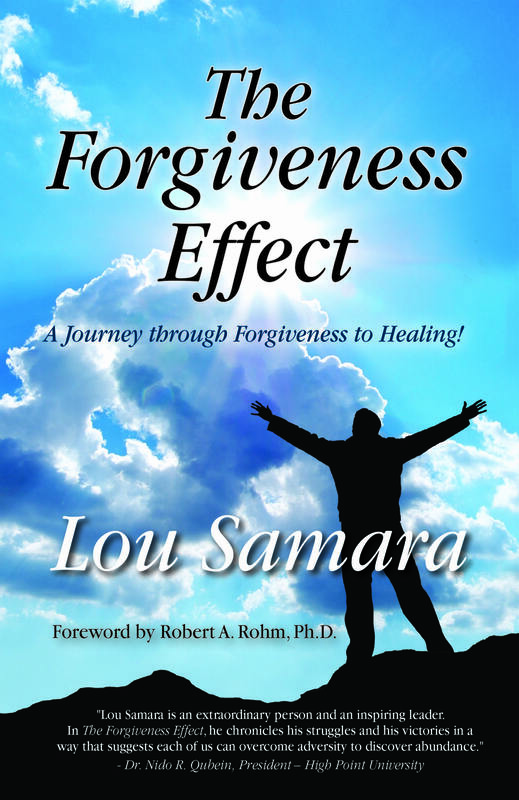 In The Forgiveness Effect, Lou offers a wholistic approach to healing through forgiveness. By reading his story and living though his experiences you will see a detailed approach on how to transform your own life through the power of forgiveness. A Journey through Forgiveness to Healing! Lou Samara is a dynamic, passionate and successful entrepreneur. He built and sold a service company in the pharmaceutical industry. Prior to that experience he spent 12 years at a Colorado Law Enforcement agency as a Training and SWAT Officer. Lou has served as State Director for the Colorado Special Olympics Law Enforcement Torch Run and a local school board. With his love for people and desire to build relationships Lou became a DISC Model of Human Behavior Certified Human Behavior Consultant through Personality Insights, Inc. in Atlanta, Georgia. Lou is an accomplished Public Speaker. He has worked with organizations giving presentations to audiences of more than 3000 people on topics regarding personal and business development. Lou is happily married to the love of his life, Leslie, and has one terrific son, Louis. Their family resides in New Jersey.